The diversity of languages along the Pacific Northwest coast presented a barrier to trade and diplomacy. These weren’t mere dialectal variants; the enormous gulf between languages was both difficult to cross and proudly guarded. Consequently, there arose a “trade jargon” — a dialect that exists only where there is trade to conduct — to use as a working language over an extensive region. 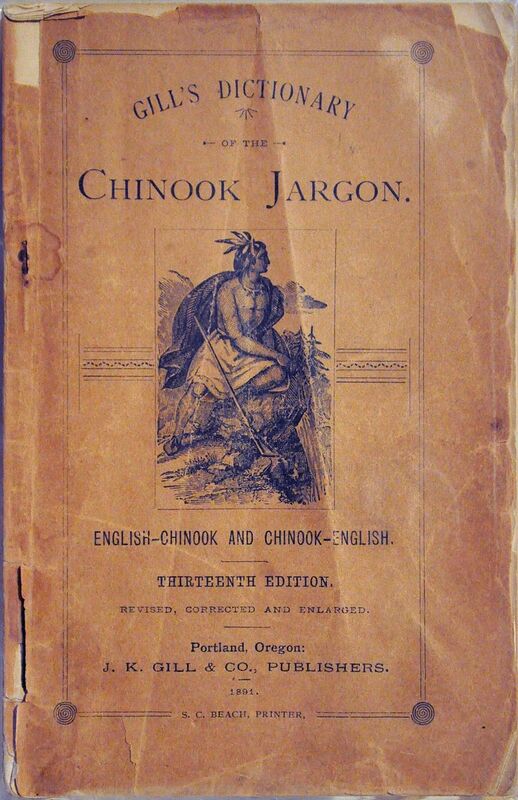 How old it is remains unknown, but linguists have concluded that Chinook, or chinuk wawa, existed before Europeans arrived in the late 18th century. In what is now central and northern Ontario, the language traders adopted was Wendat, because it was in the Wendat villages that most of the trademarts were held. The use of either a hybrid trade jargon or the language of a dominant player in trade arose precisely because trade and alliances were critical parts of Aboriginal life. When Europeans showed up, Aboriginal people understood them principally in this context: as a source of goods and as possible allies or adversaries. Almost immediately, Aboriginal people threw themselves into the business of acquiring exotic trade goods from the “foreigners with hairy faces.” The consequences for societies on both sides of the Atlantic Ocean were enormous. For better or worse, there was no turning back from the connection forged between Europeans and the indigenous peoples of the Americas in the late 15th century. Goods, crops, mineral wealth, words, and medicines flowed east into Europe while livestock, humans, plants, ideas, and much more travelled west into the Americas. This flow and counterflow is known as the Columbian Exchange. Agricultural and horticultural civilizations in the Americas were capable of building up surpluses for local trade. Having baskets full of grain or root crops ready to exchange for flint or copper was simply part of everyday business. The lands from the Caribbean north offered products such as squash, beans, maize, tobacco, potatoes, chocolate, corn, and tomatoes, all of which were quickly taken up by Europeans. Peppers and vanilla were also soon embraced. Necessity explains European interest in some of these foods: early voyagers had typically eaten their way through their onboard stocks and were hungry, and hospitable locals fed them local specialities. Figure 5.3 Maize was only one of many plants that would transform global diets and enable a massive increase in human and food-animal populations. The short- and long-term consequences of introducing these exotic crops to the European diet cannot be understated. Early exploration missions into the western Atlantic were ostensibly interested in finding a passage to Asia to acquire spices and silks; instead they acquired foods that became staples in daily living. More than that, these plants revolutionized life in the Old World: potatoes replaced grains in many parts of Europe; manioc (or cassava), while not having a huge impact on European diets, underwrote a population explosion in Africa and thus contributed to the rise and longevity of the slave trade; maize and sweet potatoes spread to China; other crops from South America contributed to the change in diet as well. For Europe, Asia, and Africa these crops — especially the starchy plants — turbo-charged population growth. The diet of the poor improved, as did birth rates. These new crops required new land use techniques, which meant that agricultural practices and land ownership patterns changed dramatically. The quantities of food that could be produced during this “Americanized” agricultural era increased at such a rate that Old World societies were able to escape the limits of subsistence agriculture and build more and larger cities on the strength of agricultural surpluses. As well, famines occurred less frequently. The export of animals from the Americas to Europe was less notable. The main export was the turkey; by 1524 the turkey reached the British Isles, and by 1558 it had become popular at banquets in England and in other parts of Europe. English settlers subsequently brought the domesticated turkey back to North America and interbred it with native wild turkeys in the 1600s. The exported animal that had the greatest symbolic and visual impact on both Europe and the Americas was the lowly cochineal, a small insect that lives on cactus plants throughout the American southwest and Meso-America. Harvested in the thousands, the female conchineal’s remains yield a variety of bright red dyes. The red uniforms that became the trademark of British troops owe their colour to the cochineal. 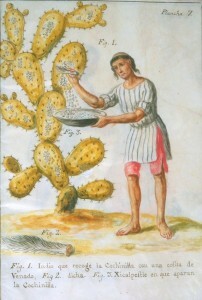 Figure 5.4 Harvesting cochineal beetles with a deer tail. Attributed to José Antonio de Alzate y Ramírez, ca. 1777. Food crops travelling the other way — from Europe — were of minimal interest to Aboriginal peoples, as they had all the food they needed. Indeed, many of the European foods that arrived in the Americas were used to sustain settler communities, not to trade with the Natives. Reassuringly familiar items like Old World grains (oats, wheat, barley), soft and hard tree fruits (peaches, plums, pears), wine grapes, and onions all made the move west, as did olives and tea in warmer locations. However, plantation crops had significant impact on the Aboriginal population as they forced a change in diet by competing with other food crops. The cultivation of new crops also contributed to the enslavement of native people and the trade in Africans. These introduced crops included coffee, sugar, bananas, rice, and indigo — all suitable for large-scale production. None of these crops significantly improved Aboriginal diets. Indeed, the plantation crops were grown almost exclusively for consumption and further refinement in Europe. The arrival of livestock, especially horses, in the Americas had very different implications. About 4,500 years after an early, Pleistocene-era horse went extinct, Spanish conquistadores brought their horses to North America to facilitate rapid movement across the land and lead cavalry charges. For the Aboriginal peoples at the time, the very idea of a human riding another animal was so fantastic that they could barely comprehend what they were seeing. But the awe in which horses were initially held did not last long. The rulers of New Spain had to prohibit Aboriginal people from riding horses, a sure sign that they wanted to do so. Horses spread north from Mexico into what is now the American southwest, and by 1606 the Navajo were stealing them from Spanish settlements. Those horses that managed to escape from corrals found themselves in an almost ideal environment of grasslands extending from Texas to the Yukon. They went feral and multiplied rapidly. For southwestern peoples, the horse became a commodity in their existing trade network. Horses were passed along in conservative numbers for generations until they reached the northern Plains in the 1730s. Around 1750, HBC traders observed Cree-Assiniboine riders with horses sporting Spanish brands. By that time the Andalusian Mustang breed imported by the Spanish — noteworthy for its short legs and barrel chest — was being bred into something more hardy by the Liksiyu of the Columbia Plateau in what is now northern Oregon. Despite having no experience with domestic animals, the Liksiyu were able to geld their animals and selectively breed them. The animals they produced were known by the name given the Liksiyu by the French: cayuse. By the early 19th century, horses had reached the British Columbian plateau; the local variant name for these horses, cayoosh, refers to a pony similar to the cayuse but bred by Aboriginal people to have stronger hindquarters suitable for the mountains. The horse had a profound impact on Plains culture. People who had depended on dogs (sometimes in the hundreds) to haul their belongings, infants, and foodstuffs in travois could move much more easily on horseback. A well-packed horse could carry more material goods than dogs could, and careful and stealthy herding of bison to jump sites like Head-Smashed-In was made redundant by death-defying charges on horseback. The Cree, Assiniboine, and other Plains communities expanded significantly, from fewer than 50 to more than 200 hundred per band, simply because the horse gave them the ability to move more goods and more people and to hunt bison over a wider range. Commerce benefited, too, from the ability of horses to carry trade farther, faster and in larger quantities. The horse also changed dramatically the nature of Plains warfare and raiding (often for more horses). In every respect, the horse was a transformational force in Plains cultures. Aboriginal peoples deployed and valued horses in other ways as well. The Five Nations early identified the hauling capacity of horses and, according to historian Denys Delâge, the Mohawks and the Onondagas both asked the Dutch for horses to drag logs. He notes, too, that there was no mention of using the horses to haul ploughs, just to move stumps and other potentially useful obstacles closer to their refortified villages. Horses in battle may have been effective in the grasslands of the Plains or the Columbia Basin but they would have been a liability in the hardwood forests and hill country of the Haudenosaunee. Other livestock also were part of the Columbian Exchange, including cows and pigs. Cattle were unknown in the Americas before the arrival of the Europeans. Evidence suggests that the Vikings brought European cattle to Newfoundland, but when their colony disappeared, so did their cattle. The Portuguese attempted to introduce cattle to Sable Island in 1518 but that colonial effort flickered out quickly. Cartier’s settlement at Cap Rouge had its own little herd of two dozen, and the newcomer community ate them up within the year. The Acadiens enjoyed more success because their drained salt marshes provided cattle with the grazing and salt they required, and the farmers didn’t need to clear tracts of forest land. On the whole, cattle in subsequent centuries fared little better. Without natural grazing patches in abundance, Canadien farmers viewed their Gascony and Breton cattle as something of an expensive luxury in the mid-17th century and their numbers never grew greatly in the age of New France. Better results would follow on the West Coast. Descendants of a herd brought to Central America in 1519 by Cortés were shipped north from Alto California to Yuquot (Friendly Cove) in 1790, in the very heart of Nuu-chah-nulth territory. In the early 19th century, fur traders drove Californian cattle along the Brigade Trails into the Interior where herds thrived on bunchgrass. By 1848 there were said to be 5,000 head at Fort Kamloops alone and, with the help of horses, they made short work of the bunchgrass environment in a matter of decades. Aboriginal people had few opportunities and few incentives to experiment in cattle-raising, but there are a few notable exceptions. The herds introduced to the Nicola, Thompson, and Okanagan Valleys in the 19th century were typically tended by Aboriginal cowboys. Also, the Acadien-Mi’kmaq community raised dairy cattle, as did Loyalist Mohawk settlements in what is now southern Ontario. In the late 19th century, the disappearance of bison herds made cattle ranching more appealing. Overall, this introduced species neither displaced Aboriginal peoples in Canada, nor did it especially excite them. Pigs were another new species in the Americas. The Spanish explorer Hernándo de Soto brought 13 pigs to the Florida mainland. As well, Sable Island was, once more, a testing ground and it hosted the first piggeries in what became Canada. In 1598 Marquis de La Roche-Mesgouez introduced a small herd whose fate is unknown. Pigs are an almost indestructible species and their numbers grew wherever they were introduced. Settlers liked them because their meat could be preserved in several different ways and they could eat almost every part of them. Aboriginal peoples, however, were less enthused about the introduction of pigs because they easily invaded crops. Fences offer little protection against pigs, and they regularly found their way into horticultural areas. On Vancouver Island, for example, pigs destroyed camas pastures and thus threatened Aboriginal survival. Other animals that were imported from Europe to Canada included sheep, chickens, cats, rats and, evidently, honey bees. Evidence that any of these were especially sought after by Aboriginal peoples in the North is difficult to find. On the whole, introduced foodstuffs did far less for Aboriginal peoples than the exported plants did for the rest of the world. Native peoples found that their wild meats and plants, the products of their own gardens, and the protein that could be harvested from lakes, rivers, and oceans were infinitely preferable to the new foods brought in. Food, however, is one of the most subtle elements in the language of imperialism. Historian Beverly Soloway has explored the ways in which the arrival of the Hudson’s Bay Company in the far north in the 17th century and the introduction of a British planted-food model disrupted (and, in many cases, eradicated) indigenous plant foodways of the Cree (Mushkegowuck) in the Canadian subarctic. The consequence of this horticultural imperialism, Soloway argues, continues into the present day in the form of poorer diets and food insecurity, an indication that the Columbian Exchange is far from finished. What’s for dinner tonight? Do a quick survey of what’s in your fridge and on the shelves, and give some thought to what you’ve eaten over the last few days. If your diet includes prepackaged food, check out the ingredients. How much of that diet derives from foodstuffs first produced by indigenous peoples of the Americas? If you consider yourself either Asian or of Asian ancestry, what share of your diet is made up of fully Asian materials? If you are European or of European ancestry, what share consists of foods originally produced by Europeans? What does the balance look like? To what extent has the Columbian Exchange become, literally, a part of your very fibre? Historically important crops and other goods travelled from the Americas to Europe, while invasive species made their way in the other direction in the Columbian Exchange. Livestock — especially horses, cattle, and pigs — had a significant impact on Aboriginal landscapes, livelihoods, cultures, and health. 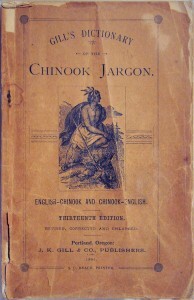 Gill’s Dictionary of the Chinook Jargon by Joe Mabel is used under a CC-BY-SA 3.0 license. Maize by Editor at Large is in the public domain. 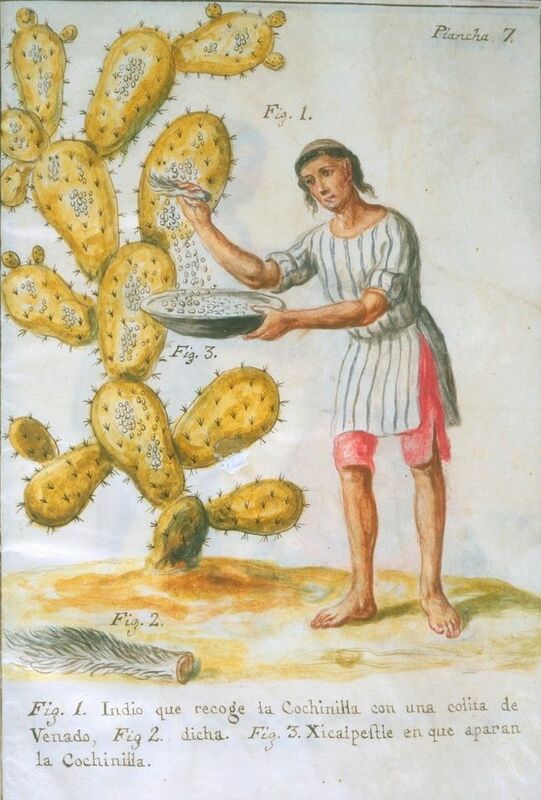 Indian Collecting Cochineal with a Deer Tail by Xocoyotzin is in the public domain. 5.2 The Columbian Exchange by John Douglas Belshaw is licensed under a Creative Commons Attribution-NonCommercial-ShareAlike 4.0 International License, except where otherwise noted.